For teens and adults alike in Maryland, acne remains one of the most frustrating, embarrassing of all skin problems. It doesn’t help to know it’s one of the most common skin conditions in the United States, afflicting many millions of people. It doesn’t help to learn that acne isn’t caused by eating the wrong foods or not keeping your skin clean. In fact, if your skin is prone to frequent outbreaks, you may very well feel there’s no help available that can truly make a difference for you. There is a solution for mild to moderate acne without antibiotics, however, at the Center for Cosmetic Surgery & MediSpa in Baltimore, Maryland. Acne treatment with Dr. Dean Kane and his staff of skin care professionals can help you look your best and feel a lot better about your skin. Request an appointment to get started. Level 1: Mild breakouts with black-heads in teens are due to inadequate exfoliation of the top layers of the epidermis trapping oil production from pores. Glycolic acid pads combined with mild cleansers are an easy and very acceptible approach for teens. Level 2: Mild breakouts with redness and whiteheads in teens, young adults and peri-menopausal women are due to diminished exfoliation and increased oil production associated with changing hormone balance. While hormone rebalancing maybe considered, exfoliation and regulation of skin cell turnover and oil production at the cell level is key. Options and combinations of non-antibiotic approaches include: Retin-A® / ZO skin care, glycolic acid for added exfoliation and blue light therapy. Level 3: Moderate outbreaks with pustules and minimal inflammation in teens and young adults are due to inadequate exfoliation allowing for bacterial growth in clogged pores causing the beginnings of infection. Combinations of more aggressive Retin-A® / ZO skin care, glycolic acid for added exfoliation, blue light therapy and Levulan® / V-Beam® laser are most effective. Level 4: Moderately severe outbreaks with pustules, cysts, chronic inflammation, swelling and tenderness typically in teens and young adults may necessitate very short courses of antibiotics, combinations of more aggressive Retin-A® / ZO skin care, glycolic acid for added exfoliation and Levulan® / V-Beam® laser treatments to control the bad breakouts. Blue light therapy and Retin-A® / ZO skin care are used for maintanence. Hormone balancing in young female adults may be considered. Level 5: Severe cystic acne may need combinations of Accutane®, antibiotics and hormone control. The strongest of our acne peels to conquer the daily problems of oil control, active acne and acne scarring. It uses the powerful exfoliating combination of Retinoic Acid with Alpha Hydroxy Acids, and Resorcinol, safely and effectively to actively shed the outer layers of dead skin – the culprit of clogged pores and acne, fine lines and pigmentation problems. Not only works to control acne, but also gives great anti-aging results. Expect mild peeling and flaking, and 2-4 days of minimal recovery time. Compliments our home Emerge Skin Perfecting Line or Medi-Spa Therapeutic Acne Line beautifully. Used for mild to moderate acne and uses a Blue Light Therapy that destroys the bacteria on the face and dries oils produced by acne. Painless and requires 8 sessions over a 4-week period. Upon completion, the acne is more easily controlled for up to one year. Combined with home acne care products, patients achieve long-term control. Excellent for young and old who continue to be plagued with ongoing acne. Great for teenagers! A combination treatment is used for Rosacea, active acne or widespread pre-malignation skin cancers known as actinic keratosis. The Levulan attracts to the irregular red active growing cells and Blu Light Therapy or IPL lasers then activates the Levulan, which destroys the irregular cells of a pre-skin cancer, acne or the redness of the Rosecea patient. 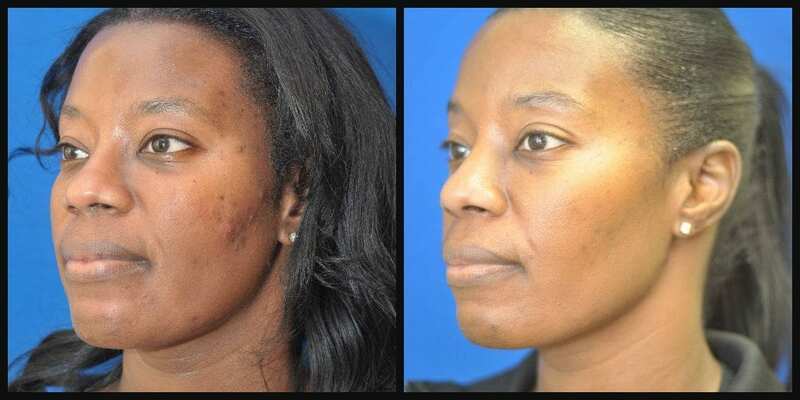 Within 2-3 treatments, individuals can see dramatic improvement in their skin, especially in severe and difficult to treat acne and pre-cancerous lesions. Patients receive the added benefit of skin tightening and smoothing. This is especially for teens struggling with the ongoing problems of hormonal and genetic oiliness, active acne and blackheads, Dr. Kane has created an inexpensive home and peel program that controls their daily acne issues. We have developed an 8-week effective program using Blu Light Therapy, glygolic acid peels, extraction peels and a Teen Acne Skin Product Line. Most of our teen patients see huge progress and control of their acne within 8-12 weeks, often without antibiotics. Everyone who battles acne knows that the pain of outbreaks and permanent scars affects more than just surface skin. Not only that, there’s only so much you can do to fight acne on your own. Contact the Center for Cosmetic Surgery & MediSpa at 410.602.3322 and get help today. Or request an appointment online. Dr. Dean Kane and Lauri Kane look forward to treating you in their office on Reservoir Circle in Baltimore, serving Delaware, the Eastern Shore and southern Pennsylvania as well as Maryland communities like Annapolis.